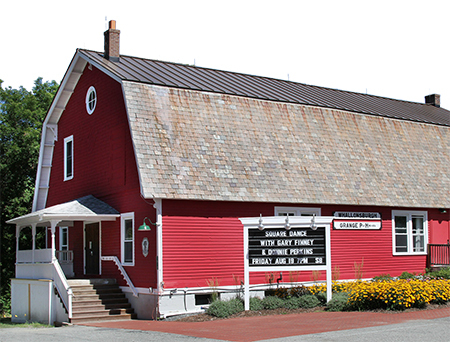 The board of the Whallonsburg Grange Hall, a nonprofit community and performing arts center in Essex, New York, is pleased to announce that it has purchased Whitcomb’s Garage in Whallonsburg, the vacant building and land directly across Whallons Bay Road from the Grange. The iconic building sits on a well-maintained 1.5-acre lot with frontage on the Boquet River. The 1950s-era garage was owned by Clarence “Narni” Whitcomb, who sold and serviced cars there until the 1990s. Mr. Whitcomb, a lifelong resident of Whallonsburg, died in 2017. The purchase was made possible through a dedicated, anonymous donation. The Whallonsburg Grange Hall, built by the local Grange chapter in 1915, was renovated and restored through a ten-year-long volunteer effort. It is now open year-round as a community and performing arts center for the mid-Champlain Valley and hosts a film series, concerts, plays, lectures, and children’s activities. For more information about the Whitcomb property contact the Grange at (518) 963-7777 or by email at admin@thegrangehall.info.